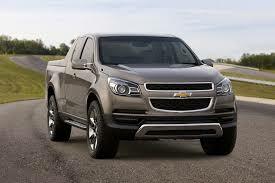 A Smaller, more Compact Chevy Pickup Truck? There has been a lot of talk over the years about bringing back true compact pickup trucks to the US like the ones that were popular in the 1970s and 1980s before the boom in large diesel trucks, where bigger always meant better. Now there are rumors that Chevrolet wants to introduce a smaller sized truck to the US market, similar to the Chevrolet Montana that is only sold in Latin America. The Montana is a tiny (for a truck) two passenger, 97 horsepower, 1.4-liter pickup. Small trucks like this are also sold in places like Australia, where they are referred to as “utes” and are surprisingly popular. Chevy is seriously considering releasing an updated version of the 1972-1981 Chevy LUV soon. The LUV is similar to the Chevy Montana. The LUV would most likely be a 6-speed automatic. In fact, it would be almost like a smaller version of the Chevy Colorado with the same transmission and engine size.Any Cons? Yes, according to the automaker’s Vice President, Mark Reuss, it is worth taking the risk. In fact, he has even stated that he loves “doing things that make sense, that no one else is doing,” The LUV would provide younger (Generation Y) consumers with a more affordable option. This generation is typically not buying vehicles at the same rate as the older generations. Finally, full-size trucks are just too big for many customers and the void that has been left after Ford stopped making Rangers would once again be filled.